The world is changing, and consumers are changing right alongside it. That’s the biggest takeaway from the 2018 Looking Further with Ford Trends Report. With political unrest, natural disasters, and a growing spotlight on social inequality around the world, the tone of this year’s report is much different than previous years. 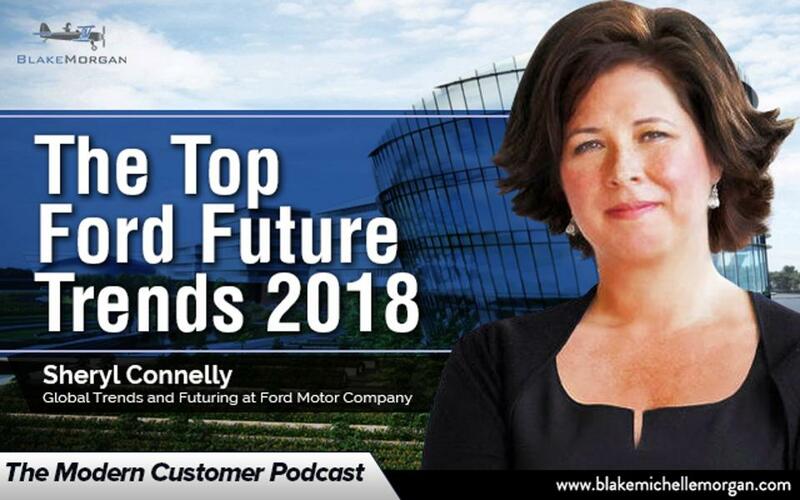 Sheryl Connelly, Ford’s futurist and the lead of the report, says consumers are feeling the pace of change. Sheryl and her team talked to 9,000 people in nine countries and identified trends that will shape how consumers think, act, and buy in 2018. There’s no doubt that recent global changes have affected everything we do. 75% of respondents around the world and 80% in the U.S. agreed that people are growing increasingly intolerant of opposing views. These changes can be overwhelming and can greatly contribute to the fabric of our global society, especially with such polarized opinions. Perhaps one of the positive elements of the recent change and unrest is that people are realizing they can no longer be complacent. The vast majority of people in the survey said they are overwhelmed by the changes that are happening. But nearly 75% of those surveyed said they believe individuals can make a difference in the world. Consumers are recognizing the importance of understanding what is going on around them and taking a stand to make the world better in any way they can. One of the biggest hot-button issues is inequality in everything from education to employment and living costs. More than 80% of adults around the world said they are concerned about the large gap between the rich and the poor. A growing number of entrepreneurs and companies are looking for creative solutions to narrow the gap between the privileged and the underprivileged. Our modern society has made it easier than ever to know what is going on around the world, which consumers feel is both good and bad. Half of all adults say following the news daily is stressful, and the majority of people surveyed said they are overwhelmed by the suffering in the world. It’s hard to escape the bad news, but people have learned to ease the pain by being compassionate. More than 75% of respondents also said that they think their actions can lead to positive change. Lately there has been a lot more attention on the link between physical and mental health as consumers realize that they can’t have a healthy body without strong emotional well-being. An increasing number of companies and governments are starting mindfulness efforts, and employers are starting to recognize that if they want employees to be productive, they need to think about the whole picture. Consumers have longed turned to shopping as a way to relieve stress and other emotions, but lately they have been re-thinking how effective shopping really is to bringing them happiness. For many people (66% of adults globally), the experience of shopping is more enjoyable than the actual purchase. Because of this, many leading companies are creating experiential stores to showcase the brand without actually having any products for sale. Big data is a huge part of how companies do business, but more than three-quarters of survey respondents say they find it creepy when companies know too much about them. The recent push has been towards privacy and transparency—most consumers don’t mind that companies have some data on them, but brands need to be open about what data they have and not have too much or use it in inappropriate ways. Technology is advancing at a rapid pace, especially in areas like artificial intelligence and automation. The views on these developments are split with 52% of adults saying they think AI will do more harm than good and many people saying being inundated by new technology is overwhelming. Instead of following the traditional path of marriage and parenthood, more consumers are staying single. In fact, half of the U.S. population is single, and there are now more single people than married people in the U.S. for the first time ever. The majority of adults surveyed around the world said they believe single people are treated differently than married people. Cities are growing, and 75% of the world’s population is expected to live in urban areas by 2050. To make things more efficient and showcase the potential of cities, they need to be made smarter. Nearly 90% of people around the world think cities need better transportation options, but smart cities also include creating healthier and happier places through master planning, connectivity, and numerous industries working together.